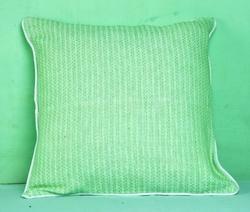 Pioneers in the industry, we offer yarn dyed check cushions from India. With years of experience and knowledge in this domain, we are engaged in offering an excellent range ofYarn Dyed Check Cushions to our valuable clients. Increasing popularity of our offered cushions in markets, remains directly attributable to their exquisite look, stylish pattern and excellent finish. The offered cushions are designed by our experienced creative designers using premium quality fabric and the latest techniques in sync with prevailing market fashion trend. Looking for Yarn Dyed Check Cushions ?